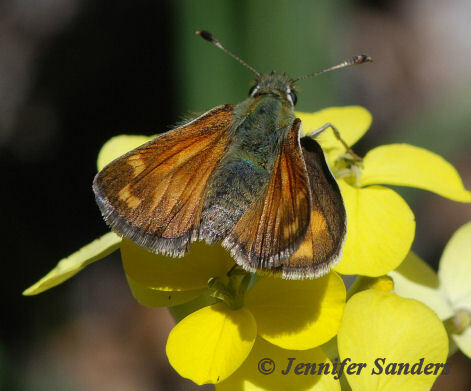 Identification: Antennae Upperside is reddish orange with diffuse dark borders and some large pale spots. Male forewing has black felt inside the stigma. 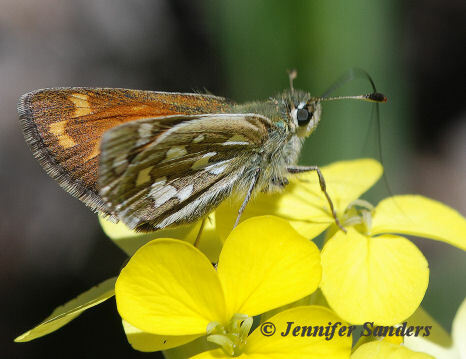 Underside of the hindwing of both sexes is golden-green to gray-green with an irregular band of white spots; the basal spot may be offset inward. Life History: To await receptive females, males perch on tops of hills or on logs or rocks in flat meadows. Females lay eggs singly on or near the host plant. Caterpillars live in silken tubes at the base of grass clumps and feed on grass leaves nearby. They overwinter in partially-buried shelters. Flight: One brood from late May to early August, the timing depending on elevation and latitude. Caterpillar Hosts: Western needlegrass (Stipa occidentalis) and perhaps squirrel-tail grass (Sitanion hystrix). 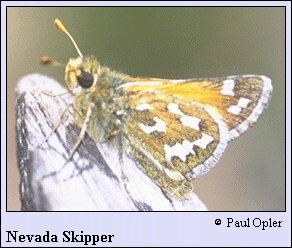 Habitat: Sagebrush, grasslands, aspen parks, mountain summits; from 7000 - 12,000 feet in elevation. Range: Southern British Columbia east across the prairie provinces to southern Manitoba; south in the western mountains to California, Nevada, Arizona, and New Mexico.